Ilya Fushman played a key role in building Dropbox, Dropbox for Business and the Dropbox platform into a product suite with more than half a billion users. Today, as a General Partner at Index Ventures, the former Head of Product at Dropbox is helping a new generation of product-first companies down a similar path. Ilya’s Index portfolio includes Slack, Optimizely, Culture Amp, and more recently, Intercom. Ilya joined me on our podcast to talk about the challenges his product team faced during Dropbox’s hyper-growth stage, the importance of building a product roadmap sooner rather than later, how to build a successful developer platform, and much more. The two biggest challenges your product team will face as it begins to scale are communication and composition. Universally agreed upon principles and values from leadership are key. At an early stage, the product team has to extract the roadmap from people’s heads and document it in some visible way. Don’t do your five-year vision on day one. Start small. A tight alignment between your marketing and product teams can drives focus, prioritization and execution in the company. A successful platform needs two things: a connection to new customers for the owner and unique functionality or tools for the developers. Startups are all about time and money management. You want to have as many shots at success as possible. No one should put out a bad product, but over polishing can be a hindrance. Matt Hodges: Our guest today is Ilya Fushman, a general partner at the global venture capital firm Index Ventures. Ilya, welcome to the show. You’ve had an interesting career trajectory in that you had a run in the VC world, then hopped over to Dropbox, where you were a head of product, before arriving at Index – who’s actually a Dropbox investor. Can you walk us through that journey and ultimately give us an understanding of what drew you out of working on product and back into venture capital? Ilya Fushman: So it all actually started a while before that. I did a PhD at Stanford in applied physics. I was trying to build a quantum computer, which was a lot of fun. To me the PhD was the ultimate product discovery process, and I’ve always loved building products. I did a startup right after my PhD with some colleagues, where we built the world’s most efficient solar cell. It was also the world’s most expensive solar cell, so we learned quite a few lessons there. After that I transitioned into venture capital for the first time at a firm called Khosla Ventures. I learned a few things, one of which was I absolutely loved venture. I love the opportunity to work with different companies, be hands on, dive into different sectors and relive this product discovery process over and over and over again. I always wanted to be in venture, but I also learned that to be effective there, you had to have experience. I wanted to be a venture capitalist who’d been there, who’d done that, who’d learned a few things and who’d seen scale. When the opportunity came up to join Dropbox early, it was a no-brainer. I spent four years there, (during which we grew from) about 50 to 1500 people. There was an amazing journey. The opportunity to join Index first and foremost was what I really wanted to do, which is help people build new products and new businesses over and over again. The second aspect was that Index is a global firm, and the San Francisco office opened up in 2011. Part of what I was excited about was building Index itself. If you look at our office, one of the things you’ll notice is all of our conference rooms are named after famous explorers. That’s to me something that embodies both Index but the ethos of venture capital, and that was ultimately the driving decision for me. Matt: You mentioned that you’d seen Dropbox go from 50 to 1,500 people over the course of four years, which is some serious hyper growth and presents a number of challenges along the way. What was the original composition of the product team like, and how did it evolve as Dropbox grew? Ilya: The very initial product team way before I got there was basically the founders – Drew and Arash. They had conceived of pretty much everything you could possibly think of building throughout most of the history of Dropbox. In fact I remember seeing a picture of them in their first office with a whiteboard, and they’d literally written down almost everything we built at the end of the day and we’re thinking about building. As a company scales and goes through these transitions and growth, first of all, everything changes. Second of all, you wind up bringing people to help extend the existing team, to take the vision from that white board, or from their heads, and actually put it into practice. The product team started with a few people, and we wound up adding more and more. We wound up acquiring lots of earlier-stage companies where the founders had product experience of bigger companies and joined our product team. We wound up taking folks who were great internally and promoting them into the product roles. As we built more specialized products, with the business product for example, we wound up bringing people with that expertise into the company. The product team evolved with the scope and scale of the overall team, and the scope and scale of the product itself. Matt: When you say “product team,” what does that mean and how was the team was structured? Ilya: Every team (at Dropbox) went through multiple evolutions and multiple restructurings. In fact we probably restructured everything every six months. If you think about a product team, there’s product management, design, engineering, user research, ancillary functions around analytics, and we kept adding these over and over again. At the beginning it was really just a few product managers, a few designers and a bunch of engineers. Matt: What were some of the biggest challenges that you faced as the team grew? Ilya: Taking a step back, most early-stage companies face fairly common challenges as they grow. Some are obviously business-specific, but the most common global challenges are a few. The first one is communication, If you think about an early stage company, you are all sitting around one table, in one room. You have one kind of hive mind, and people already know what they need to do. Let’s say you hit something like 50 people. 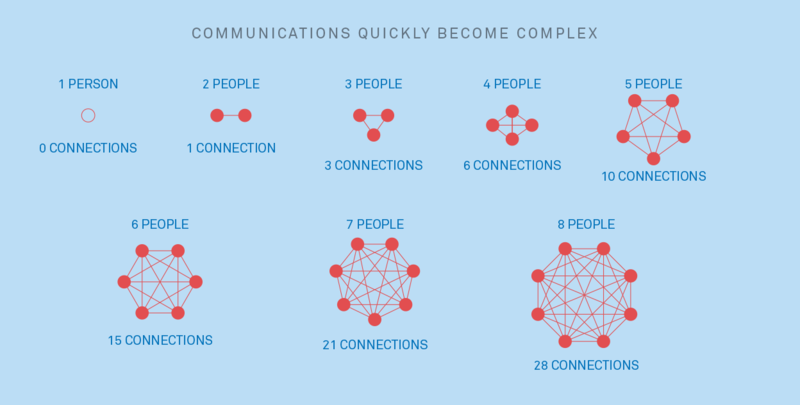 You can still be in one room, but then you need to start communicating the value of what you’re doing, the vision and the mission, and you need to get everybody on the same page. As you get to go 100-150 people, you no longer have that ability. The first and foremost thing to realize is that communication is incredibly important. The way information spreads in an organization is a diffusive process. The management team that has spent all this time together from the get go knows exactly what’s important. They’re all on the same page. One or two levels down, people have no idea. The manifestation of that is if you walk around the company and you say, “Hey, what do you think is important? What do you think we’re doing?” Small scale you’ll probably get one answer, at 50 people you might get two answers. At 100-150 people you’ll probably get four or five answers. That’s dangerous because ideally to hit your goals, to succeed in a rapidly evolving, fast-moving environment, you need everybody to be on the same page. The second challenge is (the composition of your) team. When you think about small companies, you have very few people, and they need to be able to do everything. You can’t have too much specialization unless you’re in a very particular sector, but as you grow and evolve you do need to have these specialized tasks. In the beginning you might have an engineering team that can do frontend, backend, mobile if they need to, pretty much everything. Once you get big enough and you need somebody to really do an amazing job with mobile engineering, you need that specialist. You need to make sure that the team that you’ve had in the beginning, that’s been so focused on being jack of all trades, is able to bring in this talent, incorporate it and make it successful. Matt: Can you share any tips or advice on some of the things that you implemented or instrumented at Dropbox that helped keep everyone aligned and focused on that one mission? You need a clear narrative that everybody in the company understands. Ilya: The first key to communication is to communicate. You need to find avenues and channels that are good for your organization and are effective for your organization. One of the things we did at Dropbox that was very successful was a weekly all hands, where we were incredibly open. In addition to that we had daily emails with all the stats and a very open and information driven culture. You can use tools that help you, but then the question is, “What do you communicate?” You need a clear narrative that everybody in the company can understand, and they can use to drive decisions. That narrative has to come from the founding and executive team, and everybody has to agree on it. You might change it, but for the time being, it has to be a universally agreed upon set of principles, values and priorities. If you have this consistent narrative, then people can really understand the value of the choices they make at every given step of the way, and how those tie back to what’s currently important for the company. The one caveat to that is I think people get really hung up on getting it right. “What if we get our mission wrong? What if we get our values are wrong? What if we get our priorities wrong?” That’s actually not a real issue. The most important thing is to have them, and if you have them you can iterate. Matt: It’s not surprising that at that level and that speed of growth that you saw at Dropbox that things are constantly breaking. You mentioned you’re constantly rebuilding and reorganizing the teams. Did that change how you planned your roadmap? Did you even have a roadmap when you first started? Ilya: The roadmap is a great question. The first roadmap was in everybody’s head. A big part of what the early product team has to do is extract the roadmap from people’s heads and put it into some kind of writing. It can be as simple as an Excel spreadsheet, PowerPoint or sticky notes on a whiteboard. Then there’s organization and sequencing, and a big part of that is prioritization. Prioritization is very painful, especially in companies that are growing as fast as Dropbox, Intercom or Slack, where the world is your oyster. You have all these ideas and opportunities, you want to build a platform, you want to build the product, and you want to build the next product. It’s easy to get excited, so that’s where this global narrative is really important. You need to take all these great ideas, you need to put them on a whiteboard, and then you need to figure out what is the arc over which we do them. Don’t do your five-year vision on day one. Do your first part of the vision, the second part of the vision and all the way through the fifth part of the vision. Learn how we build our product roadmaps at Intercom. Then you split up into something that looks maybe more like an infrastructure layer, and then verticalized product teams. You then pick those products teams to align to the things you care about the most. In the case of Dropbox it was the business side, the consumer side, and the platform. Then you typically would add something like a growth team to all of this, and that team sprinkles some magic. All of these are evolutionary processes, but I think the key to getting them right is getting everything out, prioritizing ruthlessly and then sequencing. Matt: How important do you think marketing is in the product development process and how involved should they be, and when? As a marketer myself and one that works very closely with the product team at Intercom, I’m really curious to hear your answer. Ilya: Marketing is actually critical – and more critical than most people think. When you ask most people, “What do you think about marketing?”, especially at their early stage, they start thinking about blogging and maybe buying some ads. Marketing is more critical than most people think. To me the most critical function of marketing, and where it really ties to product, is understanding the customer and then telling a clear narrative that connects the internal discussion to the external discussion. The internal narrative and the external narrative around what you’re doing, who the customer is, what the value is that you bring to that customer. If you can make those two very succinct and connected, I think it’s an incredible alignment that drives focus, prioritization and execution ultimately in the company. In the case of Dropbox, we had the privilege of growing rapidly without having to rely on more traditional marketing methods. In fact some of the more traditional marketing really came about when trying to build and scale the business product. Once we’d done that and built a really good marketing function, that internal alignment really crystallized. Matt: One of the big bets made at Dropbox under your watch was the Dropbox platform. Why was it so important at that time to let developers build on top of Dropbox? Ilya: It wound up being very important, but I don’t know if we really realized how important it was in the beginning. In fact the initial platform was built to support Dropbox’s own mobile apps. It was very much self-serving in that we needed a set of APIs to build the iOS and Android apps. What made the platform very successful in the early days, which was actually the same reason that it was necessary for us to build our mobile apps, was the fact that mobile devices shipped without a file system. If you were a developer that was building any kind of file experience, and you were doing it on mobile, you had to effectively use Dropbox because we had the most content. That evolved into us building more APIs and more experiences for developers. The true value of the platform didn’t really crystallize until we were able to connect the users inside of our applications with third-party apps. If you take a step back and think about what a platform really is, a platform is a marketplace. It’s a multi-sided marketplace that connects the buyers or users of products with the creators or sellers of those products. The entity that owns the platform needs to provide a few key pieces of value. The first is obviously this connection, because if you’re a developer and you’re choosing to allocate your time, you’re going to spend it on a platform that’s going to give you growth. It’s going to get you customers and it’s going to help you build your business. There was functionality our users wanted that we wouldn’t build ourselves. Secondly, there has to be something unique about why you would go through this channel. It could be the users, it could be the tool set, maybe they’re unique APIs – in our case it was the access to files on mobile devices. It could be content – in our case that was the files. It has to be some unique reason and some unique functionality that you can build as a developer on this channel that then helps you connect and acquire and retain users. For us, there was a realization that for the users this also presented unique value. You could do an infinite number of things with Dropbox. You could build experiences around consumer photos, you could build experiences around enterprise productivity, or you could build experiences we hadn’t even thought about. People were using Dropbox to record videos from drones to save the black rhino in Africa, they were using it during disaster recovery. There was a set of functionality that our users immediately wanted that we wouldn’t build ourselves. Then it was clear that we had to take a few key pieces of functionality, and these were editing of documents on mobile, things that people wanted to do with the files that they stored in Dropbox, and get them experiences around that. That’s why we did the partnership with Microsoft around Office, for example. 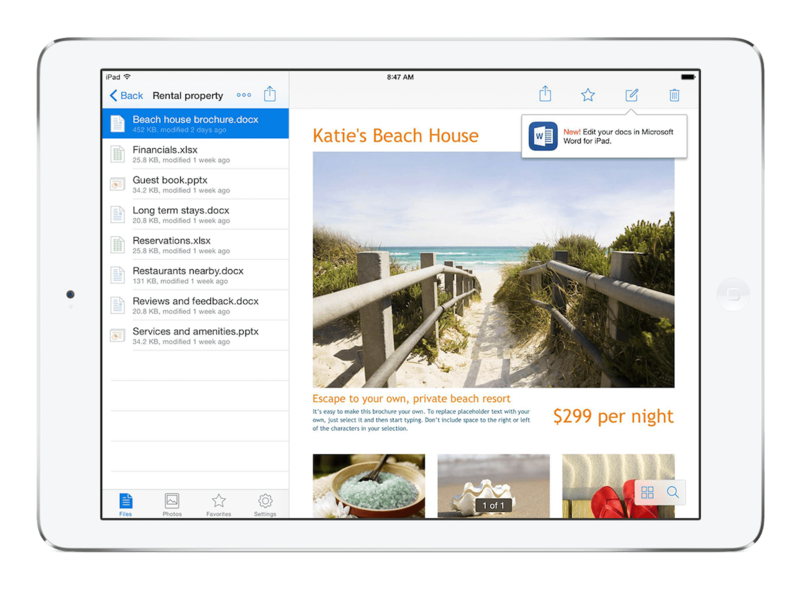 Microsoft Office integrations allowed users to edit docs directly from Dropbox and sync changes across devices. If you can get comfortable with all those three things working, then you should build a platform, and it can be very successful. If you can’t, then I think you have to think about it pretty critically. Matt: One of the benefits that comes out of making that decision to invest in a platform, is that it does allow you to focus on those core competencies that you have, and allow others to build the things you don’t plan on building. In that vein who else in our product generation is doing this really well today? Ilya: At the startup company scale, Slack has done a phenomenal job. They had actually built some of the early integrations and first applications themselves, and they’ve managed to make it a great experience. If you think about larger, more traditional companies iTunes is an incredible platform. iOS obviously is an incredible platform and so is Android, and I’m curious to see what companies like Microsoft wind up doing. Salesforce is another example of a platform that’s created an ecosystem of applications around itself. There are lots of great examples, but if you look at all of them they each have something unique, whether it’s functionality in terms of APIs or data, and they have massive scale that gives developers the confidence that they’re going to be able to build a successful business on top of this platform. Matt: It’s really important there be that opportunity for the developers to see a return on their investment on building on the platform. Zooming out a little bit, are we headed toward an era rebundling? Ilya: The era of unbundling was actually quite interesting. You’ve had the perception that by unbundling, you can create a lot of focus and a lot of growth for additional products that you might bring to life. 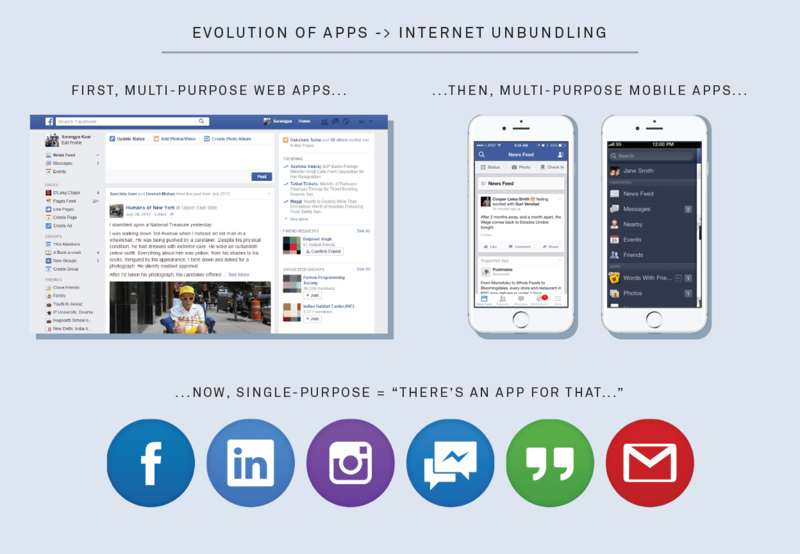 One of the biggest examples a successful unbundling strategy was Facebook Messenger. The thing most people forget is that at the time Facebook Messenger was unbundled, it already had hundreds of millions of active users. The unbundling strategy historically seemed like a great concept. If you dig in deeper and you think about your ability to create one successful product itself – which is pretty low, but let’s say you did – then get people to use that product, it’s actually very low probability. Think about typical email open rates, which are in the 10% range, and maybe click-through and downloads are another 10%. You’re talking about a 1% compounded probability that you can get a user of one of your products to use another one of your products. The odds are not in your favor. The case of Intercom is quite fascinating, which is why I was drawn to the company in the first place. It started as a very bundled product and in itself had many sub use cases. What you guys did that I felt was very genius, was took that and instead of what I would call unbundling it, you made it more easily accessible for a different functions in an organization. Inherently the foundational platform is still the same, and then you have some of these more customized use cases. In the case of Dropbox, we had a natural evolution from somebody using the consumer product, bringing it with them to work and eventually upgrading to the business product. If you have these kinds of clear paths, you can take those shots on goal and you can get people to use those products. In terms of how to think about unbundling versus rebundling, first and foremost you have to go back to this prioritization of what you want to build. Unbundling allows you to create more focused use cases, but at the end of the day you have to be thoughtful about how many investments you make at a given time. I caution people from unbundling too much, and emphasize building additional products that makes sense either for the same user you already have or an adjacent set of users that’s easily discoverable through your current user set. Matt: Looking back to your first stint in venture capital, how did the funding environment change while you were gone? Ilya: The valuations really went up. Back in the days when I was at Khosla, what you would now call a seed investment was probably a Series A. I think a lot of that is driven by the availability of capital. There’s a lot of money that is looking for higher return, higher risk investments. There’s a natural supply and demand dynamic, which is giving people the ability to raise more money, higher valuations, potentially at different stages than they would have had the ability to raise before. That said what I see today is that it’s a lot easier to start companies. Platforms like Amazon Web Services, Azure, Stripe, all the building blocks are there. It’s never been cheaper, easier, and faster to start a company. You have global market access through the app stores. Most companies even without localizing wind up getting 30-70% of their users internationally if they start in the US. We see companies in Europe making the hop here much more quickly. So while there is more capital and while the valuations are a little bit higher, the opportunities are bigger. Matt: So much is celebrated about product-first or even design-first companies. When you look at a potential investment opportunity, how important is product? Is a healthy business with a bad product something you are interested in too? Ilya: You don’t want to have a bad product, but I think there’s a degree of badness. You also don’t want to have a bad business with a great product, which is the other extreme. The most successful entrepreneurs walk that fine line between building something that they think is good and obviously want to improve over time, but gives them the opportunity to grow and learn very quickly. Startups are all about time and money management, and really it’s time management because money determines time. You want to have as many shots on goal as possible, so over polishing, worrying too much about, “Is this good enough?” can be a hindrance. On the other hand, you also don’t want to put out a crappy product. What I look for, and I think is definitely true in the case of Intercom and companies like Slack, Culture Amp, Optimizely, Dropbox and other companies I’ve invested in, are founders who understand what great products mean. Founders who are thoughtful enough to make the tradeoffs to learn fast and grow quickly. For Index in particular it’s interesting to see both the European and the US side of the world, and it’s pretty amazing to see how quickly people are able to build better products by learning from other companies. That’s something that we try to do through community effort internally. At the very early stages I want to know that people can build product. The ability for people to really figure out great products and how to build them has never been better. At the very early stages I just want to know that people can build a product. Hopefully through what you’ve done before or how you think about products, you demonstrated the ability to think critically about what is a good product and what is not a good product. You make a conscious choice as to how great of a product you build at a given point in order for you to get the information to reduce the risks in your company. At a later stage hopefully you’ve built a product that people use. Then it’s a question of can you build the commercial muscle? Can you figure out user growth? Can you figure out go-to-market? If you’re in the enterprise, can you figure out how to sell your product? Can figure out how to communicate the value this product to a broader set of users? At the very late stages obviously it’s all about the traction. Matt: Many of our listeners are early stage, so raising a round from the likes of Index might be a long way down the line. What kind of unit metrics or KPI’s do you think they should get a handle on early so that they’re able to show investors in the future that they do have traction? Ilya: First of all it’s good to have metrics. Obviously there are a core set of metrics that will be particular to the domain you’re in. We look for, again stage dependent, but very simple things. The most important thing to me is whether people who have your product using it. Have you built a product that people actually use? It may not be the prettiest iteration of your product, but it has to be an iteration that people are really using day in and day out. The worst scenario is you’ve invested a lot in building something, you put it out there, people try it and they don’t stick around. Engagement and retention of users is key. Then if you’ve done that for a small group of people, can you expand that audience? Is there growth of that user base? Inside of that user base, is there potential for natural expansion on some dimension? It could be engagement, it could be revenue, it could be something else, but really it’s pretty simple: Are people interested in your product? Do they keep using it? Are there more of them? How do we juice that growth with an investment? Matt: You’ve been back in venture capital for more than a year now. What makes an Ilya Fushman Company? Ilya: I love tenacious founders. Having worked with Drew and Arash at Dropbox, and with the founders I work with now like Eoghan and Des at Intercom, Dan and Pete at Optimizely, or Stuart at Slack, the one unifying thing for all of them is they have a big vision and there are many reasons why their vision is very hard. There are many reasons why it probably won’t work out, but they see the long term. They have this big, long-term arc in their head, and they’re willing to take the long term view and power through. That’s the most critical piece – can you be tenacious and can you withstand the ups and downs? Then, do you have an amazing idea and the ability to recruit a team at the early stage? Are you able to really reinvent yourself and evolve as a founder? If you think about it, the amount of learning that individuals in the company had to do when Dropbox went from 50 to 1,500 people was incredible. The amount of learning that folks like Drew and Arash had to do was even bigger, because they had to scale themselves to be able to manage this business and manage the future of the company. So, do you have the potential to do that? Then do you have a critical eye for products or have a critical eye for talent? Or do you have something that makes you unique in terms of your ability to figure things out? Matt: Thank you so much for your time today, Ilya. It’s been fun. Ilya: Thanks for having me.